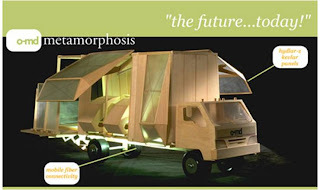 The Office of Mobile Design (OMD) has come up with a facinating take on the mobile office called the I-mobile. It looks to be an RV with hinged walls that turn into the ultimate flexible office. The perfect vehicle for the "mobile entrepreneur." I'm assuming this RV runs on biofuels or maybe those those "wings" are solar panels ;). In any case, it does test the idea of what our office is supposed to look like and how cities might be formed if not tied to a traditional infrastruture. What if every structure was "untethered" or off the grid? We could adjust our location instantly and react to market forces in a totally different way. Not enough business in San Diego? No problem...we're off to San Jose! Or how about Iowa where biofuel costs are low? Or New Mexico where solar energy is easiest to capture? Glaciers are melting and New Orleans is under water again? Try the Midwest.